The life of a child is precious. The life of a child is pure. The life of a child is a promise for the future. And the life of a child is fleeting. On October 28, 1938, the life of Cäcilie, an eight-year old in Cottbus, Germany was abruptly disrupted. Along with her family, Cäcilie was exiled to Poland for a reason she hadn’t the capacity to understand. The fear and distress she must have experienced on this most peculiar day is impossible to comprehend. 80 Years later, we’ll never know what she was feeling but today in Cottbus she is remembered. Cäcelie was the youngest of three children, born in 1930 to a Jewish family in a modern city not far from Berlin. She had two brothers: Alfred was the oldest; my father Max was the middle child (both of blessed memory). After the family’s harrowing banishment from Germany and a transition to a rustic lifestyle amidst increasingly anti-Semitic terrorizations in Poland, they were eventually forced into concentration camps in 1942. Cäcilie never made it home after the war. She was murdered, along with her mother at Stutthof. My father and his brother survived. Their father died of typhus just days after liberation at Theresienstadt. 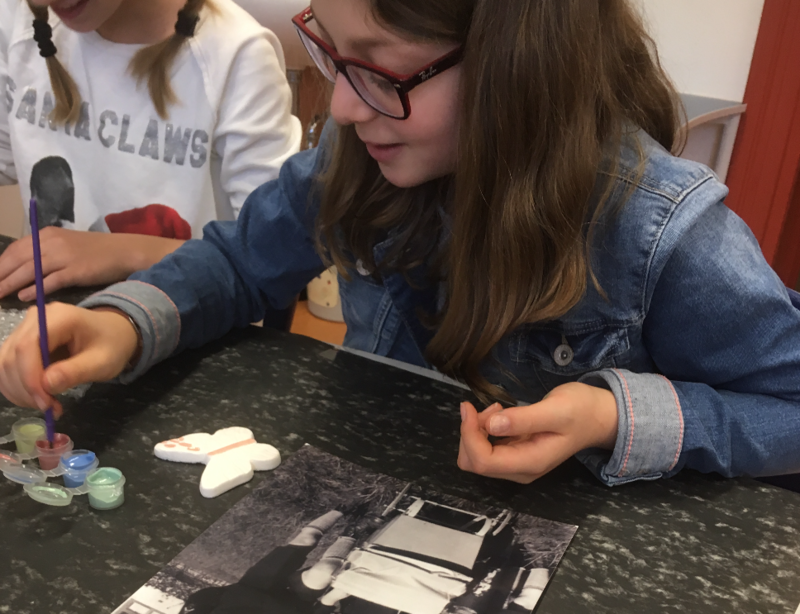 During December last year, fifth and sixth graders at the Bewegte Grundschule (elementary school) learned about Cäcilie and five other Jewish children from Cottbus who also were killed during the Holocaust: Hans Jakob Gutkind (1926), Brigitte Herzberg (1936), Ursula Breslauer (1930), Willy Naftaniel (1929) and Zilla Fuks (1942). Before December, the lives and memories of these children, snuffed out decades ago in ghettos and death camps, were lost and forgotten in the city of Cottbus. On January 25, 2019 the spirits of Cäcilie, Hans, Brigitte, Ursula, Willy and Zilla, and other child victims took flight in a beautifully meaningful way as 150 radiant ceramic butterflies were ceremoniously unveiled on the face of this majestic and historic schoolhouse. For the first time ever, San Diego’s homegrown “Butterfly Project” took wing in Germany with music, art, song and dance. The Bewegte Grundschule children were the first to launch a Butterfly Project initiative in Germany. But they are not alone in their empathy endeavor. Connecting over some 5,900 miles, schoolchildren at La Jolla Country Day also painted butterflies to remember and memorialize children lost in the Holocaust. What unites these schools is a story of survival, renewal and reconciliation. Across all these years and miles, Max Schindler’s wife, Rose has become a frequent speaker at La Jolla Country Day. And now, two schools from countries that were once enemies have become entwined to honor and memorialize those lost, to inspire today’s children to be empathetic and tolerant, and to motivate students to be upstanders. There are millions of Holocaust victims whose memories and voices have all but been forgotten. Today, the Butterfly Project is bringing the memories of the 1.5 million Jewish child victims to life with beautifully painted and displayed ceramic butterflies. For those of us connected to the past by family or faith or those inspired by the universality of our human experience, we have a responsibility to step-up in the face of growing hate, anti-Semitism and skyrocketing white supremacist acts of terror and propaganda, to act to repair our world – tikkun olam. Amid this heart-warming and tolerance-inspired Butterfly Project initiative at the Bewegte Grundschule lies a polarity: Cottbus has also become a gathering place for Germany’s nationalist, anti-immigrant and neo-Nazi political party, the Alternative for Germany (AfD). Only two days after our first-ever Butterfly Project ceremony and unveiling in Germany, the AfD held an anti-immigrant rally there on International Holocaust Remembrance Day. In response to the appeal of friends and to demonstrate our support of the Cottbus community, I returned (along with my brother, Jeff) to join with the Green Political Party and other Cottbus upstanders to counter this AfD rally. In these few short days I experienced both the beauty and hope for a better future in the words, art and actions of children, and witnessed the danger of resurgent anti-immigrant and anti-Semitic hate only a few feet away. This day with the Green Party is a story for another time. January 25 was a bitter cold and beautiful morning in Cottbus when along with my children Alex and Ariana, my brother Jeff and his son, Joey, and my partner Amy Parish, I joined extraordinary children in Cottbus to honor and memorialize Cäcilie Schindler, Hans Jakob Gutkind, Brigitte Herzberg, Ursula Breslauer, Willy Naftaniel and Zilla Fuks and other child victims of the Holocaust. And while it was a day that included some sadness, it was far outshined by the empathy and warmth of these children and the knowledge that if it were up to them alone, the future of our world would be the one inscribed on the acrylic panels that display the butterflies at the Bewegte Grundschule: peace; remembrance; tolerance; humanity; and hope. For more information about The Butterfly Project visit www.TheButterflyProjectNow.org or email Steven@ConnectivityLLC.com.